Don't make a honey of a mistake. 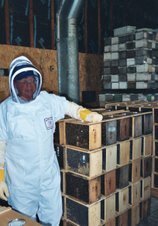 Now that the honey flow is going, a warning of a common mistake that many new beekeepers make. Honey supers have to go on now. Don't make the assumption that I will leave it for the bees and put on supers next year. with honey. The brood nest gets plugged up with honey the queen has no place to lay. Now the hive will start to dwindle. 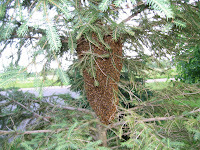 The hive will not have enough bees to overwinter and will not survive. With warm temperatures it is important to keep the grass down in the bee yard. This will help to prevent swarming. There seems to be a good nectar flow going in the Stillwater area. My package bees are starting to move up into the supers. 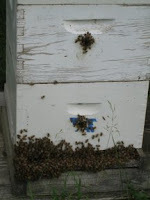 I have four supers on many of my over wintered colonies and they are in all the boxes. Still getting swarming reports, I hope this will wane with an increase in the nectar flow. If you haven't put you supers on yet, in the words of Basil Furgala, You can't make any honey if the supers are still in the garage. My over wintered hives are in two deep and have one or two supers full of honey on them. The package bees are all in two deep and will be getting honey supers this week. I have reports of new beekeepers with foundation putting on their third deep last weekend. One persons hive had two deeps. She had stopped feeding it and the brood nest is slow to expand. On foundation, feeding is needed until mid June. If it gets into the 80's I think the entrance reducer could be pulled, or for sure by mid June. Time to put on honey supers now. I see the black locust have been blooming for about 10 days. I am seeing yellow sweet clover in the ditches. Alfalfa and other clovers should start blooming shortly. An old beekeeper once told me that the main nectar flow starts 10 days after the first clover bloom is spotted. Get ready and check for swarm cells. The swarming season is upon us.